Great location business offers expanded services incl. 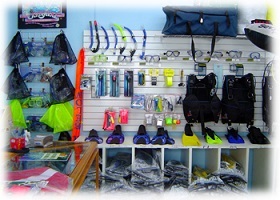 wholesale distribution of SCUBA dive equipment n accessories, equipment 'boarding', equipment rental and an exclusive SCUBA gear line for Mex/C.Am. Clients from Mexico, Belize and US. Trained technicians are certified to work on all brands of regulators; the only repair center in Mexico and Central America auth'd by DAN to service/clean o2 regulators n bottles. Inventory and Pickup Truck included. Full support from seller. RE available.